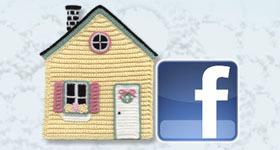 ← Annie’s Craft Festival Free Class Giveaway! I had a LOT of FUN last weekend! 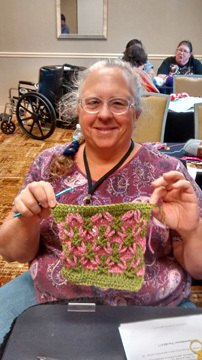 On Thursday, Oct. 29, I flew to Fort Wayne, Indiana to teach 3 crochet classes at the 1st Annual Annie’s Craft Festival on Friday and Saturday. Yes, you heard that right. Annie’s will hold this craft festival once a year! 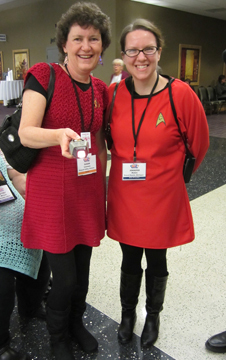 The next one will be Sept. 16-18, 2016 at the same place, the Grand Wayne Convention Center in Fort Wayne, IN. There were several things that I taught the ladies how to do in this project. By far the hardest is carrying the padding cord along the edge and working the edging, which turns twice to create the arches. I demonstrated these before the end of the class in small groups of students so everyone could see what I was doing. Also, creating the chain loops BEHIND the previous round of petals on the rose was new to most of the students. I think it’s always much better to learn something like this in person in a class rather than trying to learn it on your own! And working into the back loop of the sc on the leaves to give them the ridges was new to some of the students, as well. All in all, everyone did great with their projects! 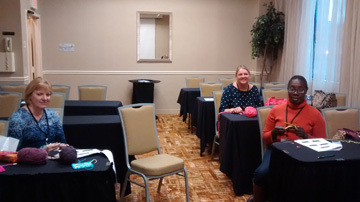 One student finished crocheting her piece and another student only got the center rose done in the 3 hour class (she hadn’t done thread crochet before, so it took her a while to get the hang of the small thread and small steel crochet hook, which is totally understandable). Everyone else got to somewhere in between, with many of the students finishing the rose, both leaves and starting on the background mesh around these motifs. It really didn’t matter how fast or slow the students worked, as long as they understood how to work everything correctly. 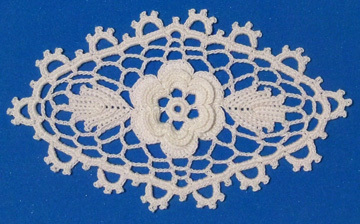 First, I bought two 5-packs of size 10 Lizbeth crochet thread. These packs are already color-coordinated for fall and autumn, which I thought were the same thing, but that’s how they’re labeled, so I’ll go with it! I can envision lots of beautiful designs using some or all of these threads!!! And they were on special (normally $19.95 each) for $15.80 each plus an additional 15% off! How could I pass them up at those great prices? Obviously, I couldn’t! I got all 10 balls for just $28.47. They’re normally $3.95 each before taxes! The 2nd thing I bought was 3 knitting patterns by Pam Powers. These are fabulous patterns. They’re photographed nicely, they’re laid out well, they’re printed on tri-fold heavy cardstock and they have wonderful charts, too. They were buy 2 (at $7 each), get 1 free! So I picked out my favorite 3 patterns to make or learn from to design other knitting patterns. 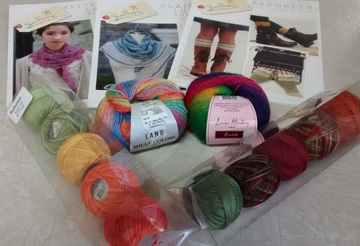 I bought the patterns named Clair De Lune Shawl, Battenburg Lace Scarf and Brooklyn Boot Liners & Mitts. 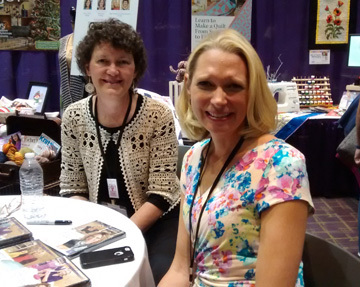 I really enjoyed meeting Pam in her booth and talking with her at the show. 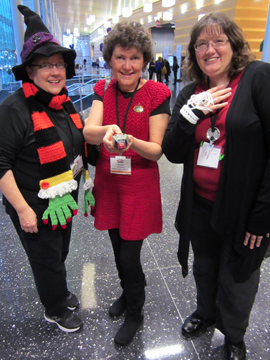 She has a book of knitting designs called “Dress-to-Impress Knitted Scarves” by Stackpole Books. I really like a lot of the projects in that book, so I’ll have to add it to my ever growing “wish list”! The 3rd thing I bought was 2 balls of beautiful yarns for knitting or crocheting. They are Louisa Harding Yarns Amitola and Lang Yarns Mille Colori Baby. I have some 1-skein projects in mind to design with these yarns! 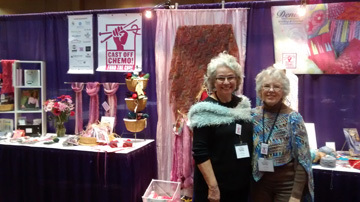 Cast Off Chemo has some very nice knit and crochet patterns for sale. All of the proceeds from the sale of their patterns go straight to the cancer research. You can see all of their patterns on their Ravelry page here. 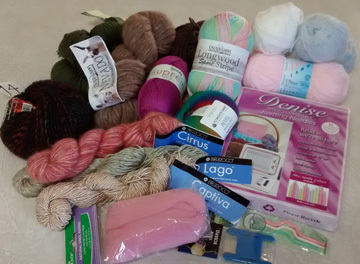 I got a skein of some really pretty pink yarn (by Wool2Dye4) from Linda to design something for this project. I’ll have to put some thought into what I can design with the 400 yards in the one skein of yarn. Of course I’ll let you all know what I design and when the pattern is available for purchase from Cast Off Chemo! 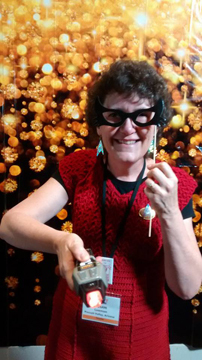 There was a Gala Banquet on Friday evening with Debbie Macomber as the keynote speaker, but I decided to relax that night and not try to do everything at the craft festival! Often, I try to do too much and suffer the consequences when I do! It’s rough getting old!!! 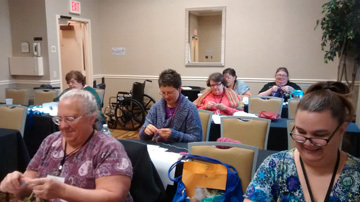 As you can see, these classes were pretty small, but they were enjoyable and went great! All of the ladies in the classes (except for one who left early) learned the techniques. 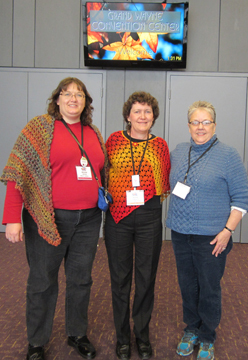 Two of the ladies in the Polish Stars class actually took my Irish Crochet class the day before, too! I was able to sit and demonstrate the Intermeshing to the 3 students in that class, which helped immensely! Since my classes that were originally scheduled for Sunday were cancelled, I flew home on Sunday. I really enjoyed the 2 days that I was there and look forward to attending/teaching again next year! 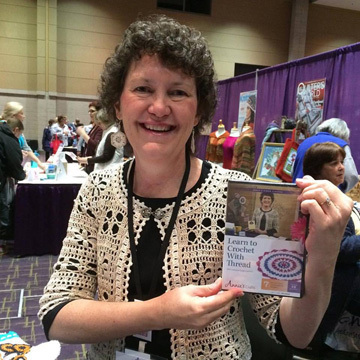 I hope you’ve enjoyed this glimpse into the fun that I had at the Annie’s Craft Festival. And I hope you’ll consider attending next year! Keep your eyes and ears open for more information about the 2016 Annie’s Craft Festival! I look forward to seeing/meeting you there! 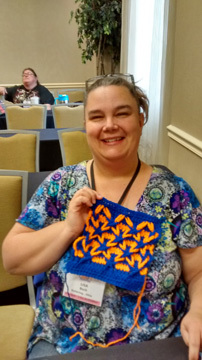 This entry was posted in teaching crochet and tagged classes, teaching. Bookmark the permalink.